I had a bit of time on my hands and decided to wander into the Chanel boutique on Brompton Road. If you're an impatient shopper like me or a tourist (and you're pressed for time), I would seriously urge you to try out this store instead of the ones at Selfridges, Bond St, Harrods or Sloane St. It's a large store in a beautiful and quiet part of London, outside of the tourist zones and the sales associates generally have time for you. The 2.55 flap has been a hit and miss with me. I know it works for some but seeing that I'm a packrat, the larger sized quilted bags kill my shoulders after a day out in town. I think my biggest gripe would be the horrendous price increase over the past 5 years. I remember one summer when the price soared by £500......... from £2600 to £3100. One of the more affordable options would be the Wallet on Chain or known by its acronym WOC. 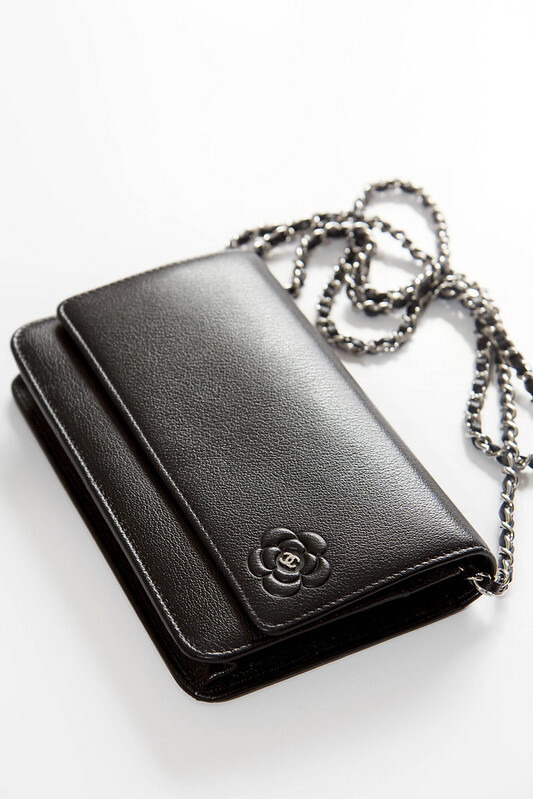 I saw this understated and elegant purse with an embossed camellia on the flap. I was told the leather's made of calfskin but the sheen, weight and grain point towards goatskin. It's the lightest WOC I've ever held and at £835, it is £300 less than the caviar leather option. As for its durability, I would say, the goatskin sits between the lambskin and caviar. You're likely to see light surface scratches but it's more resistant to scuffs as compared to lambskin. Do ask for Greg if you're there. I've seen him go through every bag with a fine toothed comb just to make sure the customer got the one that was completely flawless. He's happy to reserve an item for it to be picked up at a later date too. Hi Marlene, I have exactly the one you mentioned! I asked for the cheapest WOC at the Heathrow airport, and the camellia WOC is the one available. The only fault I find with WOC is that their lining are rather thin. I wonder when it will tear. Hi Cecilia. Hmm....I'm not sure about the lining. I think the lining in wallets in general, tend to be thin though I've yet to see any of them rip other than the coating on LV wallets. How's yours holding up? I bought the WOC sometime early 2013 at GBP695 nett. It's still holding up well and can fill in more things once the leather "stretch" (for lack of better word) compared to another WOC that I use less frequently. WOCs are very addictive! And the price point made them "easier" to collect more. My friend recently bought the quilted WOC (at her SA's staff discount somemore! lucky her!) and the "side lining" was even thinner than mine. We were both wondering what will happen if we put some sharp objects into the WOC. My goodness, talk about a price increase! On the other hand, it's still more affordable compared to the standard flap now. Ack....good on your friend for managing to get a decent discount on hers. Caviar is ridiculously hard to find. I got tired of waiting. I guess any caviar WOCs or flaps come in and fly out the door again so quickly.